There are few first-hand accounts of the working conditions of Victorian constables in Manchester, and those available were generally written by well-educated senior officers such as Superintendents Bent and Caminada. Preserved artefacts and minutes only provide a administrative framework in which to re-create the experiences that ordinary officers endured. Figure 20 Superintendent Bent and his wife. The following rare account of a late Victorian constable is taken from the 1938 autobiography of W. T. Oversby, who was born in 1856 in a cottage at Livesey Hall, Blackburn, Lancashire. The account is important in that the author details his life, rising from an impoverished farmer’s son during the cotton famine, through his eight years within the Lancashire and Liverpool police forces, to that of a Poor Law Union relieving officer, a successful insurance manager and a Liverpool magistrate. 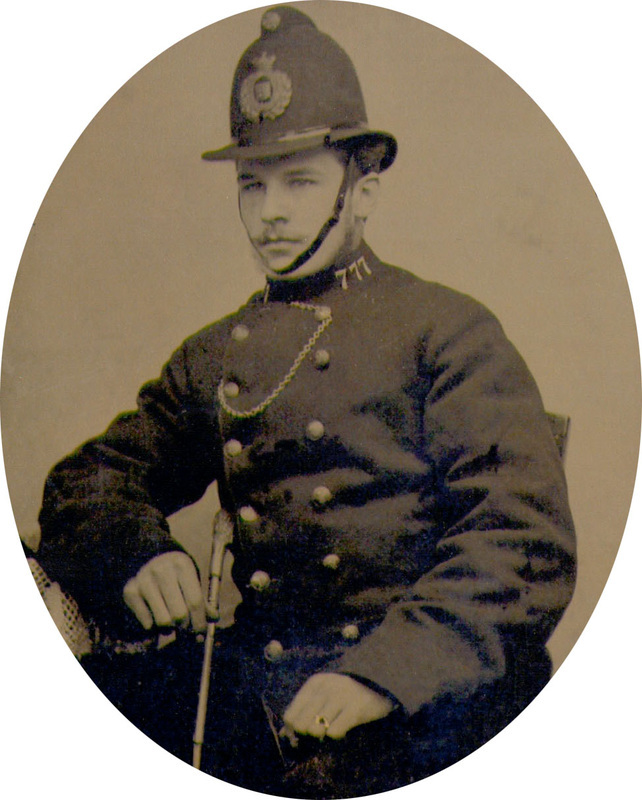 His experience of joining the Lancashire Constabulary, Manchester Division in late 1874 at 18 years of age reveals much about the working conditions and duties of a Victorian policeman. His account has been compared with available primary and secondary sources. After the important medical examination and three weeks training at the Lancashire headquarters in Preston in 1874, PC Oversby was posted to the Old Trafford Division at East Union Street PS under Superintendent James Bent. Oversby was paid £1 3s. 11d. (£1.19) a week as a third-class constable rising by 3d a day (1s.9d. a week or 8p) for each class. He considered this as ‘truly a vision of wealth’. It should be noted that the police forces paid only what they required to maintain the establishment. Wages varied according to local economic and employment conditions and significantly within forces. Oversby had previously been a weaver working in a cotton mill earning on average 15 – 20 shillings a week. Fig 21 PC 777 W.T. Oversby taken in 1874. By kind permission of his grand-nephew Christian Mason. We the Divisional representatives of the Manchester Police Force beg respectfully to submit for your consideration the attached memorial and earnestly request that you give it your careful attention . Feelings of dissatisfaction amongst us over the number of hours and inadequacy of pay to meet increased rental and advanced price of food and every domestic consumption. Officers obliged to live out of Townships and being debarred from the privilege of living in Salford make day-duty tours, which include walking to and from the Divisional Station four times daily, at least 14 hours…[not] if split into eight hour shifts as per London and other forces. In the Borough of Salford pay has increased in advance of ours and the County of Lancashire and other forces. Officers have only four Sundays off each year and a strong inducement is required to keep us in the force which requires our duties to be lightened and pay increased to enable us to truly feel that we are members of a Force second to none in the Country. In October 1873 the WC increased pay by 2 shillings a week for constables and 1 shilling for sergeants and by April 1874 Manchester’s pay had increased to 24 shillings rising to 28 shillings for a constable, which matched that of the Lancashire Constabulary and the newly appointed PC Oversby. This agitation for better wages and working conditions came at a period of rising trade union recognition and improving wages. Recruitment to the forces was a serious and long-standing issue and pay was evidently a major factor in an individual’s decision to join. It was one the WC understood. An examination of the Manchester Police establishment figure reveals this point. The Watch Committee’s and the Chief Constable Palin’s annual report on the criminal statistics in 1874, shows how the actual strength of the force fell away during the four years under examination here (1870-73), before a recovery in 1874 when wages improved. [see Statistics - Table 5]. Emsley has examined the working backgrounds, origins and motivations of recruits in sample forces from 1840-1930 and he revised the view that most constables were agricultural labourers from neighbouring counties or Ireland. It is true however that rural men were preferred over their urban counterparts in the police due to their stronger constitutions and acceptance of discipline. Oversby’s upbringing fitted this stereotype in some ways but his evident intelligence, motivation and age set him apart from the average recruit joining at that time. The average age of recruits in England fell during the later half of the nineteenth century to the low twenties – the Lancashire Constabulary fell from 27.8 years in 1850 to 24.8 years by 1870. Emsley equates this fall with an increasing move towards a career and Oversby’s prospects were significantly improved by his age and abilities. His intelligence set him apart as skilled tradesmen and clerks formed only 9-12% of recruits, other employments being generally more manual. Lastly, urban forces were less able to attract local men than rural or distinctly county forces, until the early twentieth century which Emsley suggests indicates ‘a greater local acceptance of the police as a career and an organisation’. This retention of experienced officers leads to the professionalisation of the force and subsequent improvement in tactical capabilities. Oversby was housed at Monmouth Street PS along with three other constables. The inspector and his wife occupied the main house whilst the sergeant and two other constables lived nearby. He provides a rare and unusually detailed description of this police station house as well as the Rusholme District. Oversby recalled the population of Rusholme to be 8-10,000 souls comprising of mainly middle-class merchants, warehouse men and clerks, with one poor area of six streets he called ‘Alsatia’. This appears from the 1889 OS map to have been the area to the west of Wilmslow Road from Victoria Street back to Monmouth Street either side of Princess Street, east of the Moss Side ward boundary. The rest of the beat encompassed the desirable Victoria Park estate bordering with Manchester prior to High Street in the North. Monmouth Street PS in 1874 was described by PC Oversby as, 'A ramshackle establishment, which in most respects was a disgrace to the community. Prisoners were detained in a very primitive fashion in a cell'. Oversby describes his abhorrence at the sanitary condition of the cell especially after occupation by a drunkard and the ‘effluvium’ or odour as deplorable. This mirrors the accounts of Manchester police stations of the mid-Victorian decades. His living conditions were almost as sparse as the cell with two constables in each small top-floor room with just an iron bedstead and chair. The four constables shared a living room eight foot square containing four chairs and a table plus a wooden locker for each officer to store their food as they cooked for themselves. Their sole toilet was situated in an out house 30 yards behind the Inspector’s dwelling. Of note is that the 1906 photograph of Monmouth Street PS (top) displays a clear date on the station house of 1876. The station is mentioned in WC minutes in 1860 and clearly described by Oversby in 1874, and he worked there until 1876, but makes no mention of a new station being built. No evidence exists in the directories of a different location. It is possible that this date refers to a renovation or rebuild, which was not uncommon. Monmouth Street PS was rebuilt after its adoption by Manchester police in 1885. The following letter to the Manchester Guardian cast some light on the matter. Rusholme and its Streets: To the editor of the Manchester Guardian. E.M. 25 July 1876 [Manchester Guardian 27 July 1876]. Police service restrictions on a constable’s social life were extreme and Oversby was not permitted out of the station during breaks in shifts without authorised leave, this accepting he also worked seven days a week. 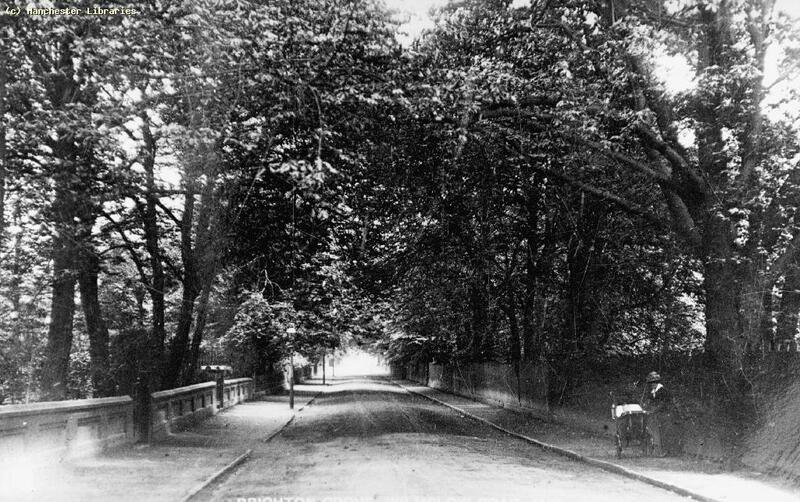 Oversby’s beat around what is now Birchfield Park took two hours and was so regimented that ‘the sergeant knew almost to the length of a street where to find a man [constable] at any time’. Oversby’s accounts of the single-handed confrontation of drunken and violent men highlight the physical rigours and dangers of a constable’s work, with only a wooden staff, handcuffs and whistle to assist him in arresting and escorting a prisoner to the station cells. He details one account of ‘confronting five roughs muddled with drink’ who proceed to attack him and knock him to the ground, dragging away his whistle and dislocating his shoulder. Only on the arrival of a fellow officer did they manage to get two offenders to the station and then return to search for and arrest a third. In conclusion what Oversby’s account reveals, more than his tales of ‘daring do’, is the basic principle of Victorian police work, that all beats were patrolled regularly by a uniformed police officer from a nearby police station. That prisoners were able to be man handled back to a local police station, was essential for the prevention of crime and to provide visible public reassurance that the peace will be maintained. Superintendent J. Bent, Criminal Life: reminiscences of forty-two years as a police officer, (London: J. Heywood, 1891). Caminada, J. Twenty Five Years of Detective Life, (Manchester: Heywood 1895-1901)(Vols.1&2). W.T. Oversby, ‘A Life’s Romance’, (Liverpool: Daily Post Printers, 1938) p.8. Oversby, ‘A Life’s Romance’, p.54. In the severe winter of 1878 Superintendent Bent set up a soup kitchen at East Union Street PS to feed nearly 2000 children a day from public subscriptions. Bent, Criminal Life, 1891. Also detailed at the GMP Flickr site www.flickr.com/photos/gmpolice1/6516800257/ 12.12.2012. Oversby, ‘A Life’s Romance’, p.22. Oversby, ‘A Life’s Romance’, p.19. Real wages rose by 40 per cent between 1862-1875. A. Briggs, A Social History of England,(London: Penguin Books, 1987) (2nd ed.) p.239. E. Hobsbawm, Industry and Empire, (London: Penguin Books, 1999)(2nd ed.) p.138. Watch Committee Annual Report to the City of Manchester 29 October 1874, Watch Committee Annual Reports 1874-1880, Greater Manchester Police Museum & Archive. C. Emsley, The English Police: A Political and Social History, (Harlow: Pearson, 1996)(2nd.ed.) pp.191-3. In Birkenhead 26 per cent of the establishment were from Ireland whereas only 2 per cent were from the Borough. A figure almost reversed in Hull. C. Emsley, English Police: A Political and Social History, (Harlow: Pearson, 1996)(2nd.ed.) pp.191-3 and TABLE 9.5, p.198. Emsley, The English Police, p.199. Renting or lodging being the normal practice. This station was transferred to the Manchester City Police with the Manchester City Extension Act of 1885 and the City Engineers photograph dates from 1906. First mentioned in WCM in 1860. See Monmouth Street PS page. Oversby, ‘A Life’s Romance’, pp.23-4. Named after a precinct in White Friars London occupied by debtors and criminals: Oxford English Dictionary online. http://www.oed.com/. 15.12.2012. OS Map Victoria Park 1889 Lancashire sheet 104.15 (Godfrey Edition). Oversby, ‘A Life’s Romance’, p.23. Only by 1892 did the WC pay £25 for four wc’s to be installed, WCM 14 April 1892. Oversby, ‘A Life’s Romance’, p.24. All received short prison terms, ibid p.26.